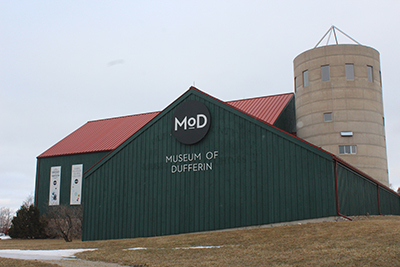 It has been a year of unprecedented change at Dufferin County’s museum. A fresh name, upgraded space and breathtaking new exhibits – it has been a transformation unlike anything in the facility’s rich 25-year history. Sitting down with the Citizen this week, the museum’s Curator Sarah Robinson, Archivist Laura Camilleri and Marketing & Events Coordinator Nanci Malek discussed what has been a monumental transition over the past 12 months. It all began in early 2017, when the museum learned it would be receiving $150,000 in federal funding to upgrade the facility. The team immediately set out on a plan to reimagine the second-floor mezzanine and build a permanent home befitting of the museum’s crown jewel – Corn Flower glassware. The doors of Dufferin County Museum & Archives were closed for eight months, from January to August last year, as work on the new exhibit, as well some other notable upgrades, were carried out. While the community was bracing itself for a grand opening – for both the renamed Museum of Dufferin and the Corn Flower exhibit – Ms. Robinson was working hard on another project she was eager to roll out, that being a brand new display she called ‘Temperance and Temptation’. It debuted on Aug. 5, 2018. Set up on the museum’s main level, the exhibit takes visitors on a trip through time. Set in 1904, the central feature of ‘Temperance and Temptation’ is a recreation of the old Alexandra House hotel, which once stood on Broadway across from Town Hall. The building was demolished in 1989 when it fell into disrepair, making way for a paved parking lot. Now, the once notorious bar has been reborn, with Ms. Robinson explaining how she recreated a specific scene. The scene features an old-school bar, piano and buffalo skin coat. With an old jail located immediately beside the tavern, it makes for a “pretty neat set-up”, says Ms. Malek. As something of a side offering, the museum, in collaboration with Central Counties Tourism, has hosted a couple of “experience tours”, where locals spent two days experiencing the history of bootlegging in the York, Durham and Headwaters regions. An escape room was also set up inside the tavern at the museum in the fall, which Ms. Camilleri notes was a great success. The team plans to bring that feature back this summer, with several offerings planned for June, July and August. Speaking of Ms. Camilleri, she has been keeping busy with her Archivist on the Road series. Originally designed as something of a fill-in while the museum was closed for the renovations, Laura spends one day per month at each of the Grand Valley, Orangeville and Shelburne libraries, providing local residents with research material and stories. Laura said she will typically see between 15 and 20 people, on average, at her library visits. While the original intent of the initiative was to continue offering research assistance while the museum was closed, it has evolved into much more than that. Now, the main focus is to accommodate people who physically cannot make it out to the museum. Archivist on the Road will continue for the remainder of 2019. The next scheduled event is to be held in Orangeville on Valentine’s Day (Feb. 14), with the focus of that day’s workshop centring on love letters. Discussing the transition of Archivist on the Road, Ms. Malek says it reminds her of why the facility decided to rebrand from Dufferin County Museum & Archives to, simply, Museum of Dufferin. A new, remodeled website came hand-in-hand with an upgraded facility. Now, Museum of Dufferin offers a wide array of online services, including a genealogy database, a collections database and even online exhibits. Sufferin’ in Dufferin debuted late last year and tells the story of the Spanish Flu, which killed more than 30 million people worldwide between 1918 and 1919. Another online exhibit is planned for this fall. While it has yet to be named, Ms. Camilleri noted it will focus on “the lawless in Dufferin”. Also coming up in 2019, the museum will host an art exhibit titled ‘Nature and Structure’, debuting on April 28. Featuring work by Emilia Perri, owner of Maggiolly Art Supplies in Orangeville, the display will be a “wonderful addition” to the Museum of Dufferin, says Ms. Malek. Another planned temporary exhibit is the ‘Dwelling Museum’, created by Debbie Ebanks. This particular exhibit, which will open on Sept. 15, also an art display and will focus on the stories of recent newcomers to Canada and the way they have gone about building a new home. Each of those two travelling exhibits will run alongside ‘Temperance and Temptation’ and ‘True. Grit.’ – the museum’s two main floor exhibits. ‘True. Grit.’ has been a mainstay at the museum since May 2017 and features 45 individuals and 26 different themes that embody the rich history and deep sense of community that flows through Dufferin County. The exhibit has been a huge success, says Ms. Robinson, and will run until December of this year. As impressed as this reporter was with the many offerings on the main level of the museum, it’s the newly redesigned second level that truly takes the breath away. The Museum of Dufferin boasts the single largest public collection of Corn Flower glassware anywhere in the world, with more than 2,500 unique pieces. Now, it also has a dedicated display to match any other. The 472 unique pieces of Corn Flower, a type of glassware recognized for its popular floral patterns and created by one-time Dufferin County resident W.J. Hughes, sit in a beautiful array of displays, glowing thanks to state-of-the-art lighting design. Since the gallery’s grand opening last November, hundreds of residents have been pleasantly surprised by the quality of the exhibit. The Museum of Dufferin has become a popular destination for Corn Flower collectors. One “cool” aspect of the exhibit, Ms. Robinson says, is that it tells the story of Corn Flower in chronological order. “That wasn’t always a part of our display before. A lot of it was just to make sure we get the glass into a display so people could see it. Now we’ve been able to incorporate something of a story, which I think people have really appreciated,” Ms. Robinson added. While the Corn Flower gallery is a permanent exhibit, it won’t be a fixed one, Sarah says. “Every year or so we’ll bring in new pieces, rotate things in and out. We designed the displays so that they could be edited. I think it’s important to change things up every now and again,” Ms. Robinson said. Sarah adopts the same attitude with her other exhibits, noting Temperance and Temptation has already undergone a few edits since its opening in August. She will continue making slight adjustments until it leaves in August 2020. With one eye on the future, Sarah says she’s already started working on a new exhibit she plans to debut in 2020. Taking over from the ‘True. Grit.’ display on the main level, the new feature will focus on life in the 1920s. For more information on the Museum of Dufferin and everything it offers, visit dufferinmuseum.com.